The top court rejected the Centre's vehement contention that there was no general or fundamental right to privacy under the Constitution. In a landmark verdict, the right to privacy was on Thursday declared a fundamental right under the Constitution by the Supreme Court, which said 'privacy is the constitutional core of human dignity'. The judgment, which will have a bearing on the lives of all Indians, said that 'the right to privacy is protected as an intrinsic part of the right to life and personal liberty under Article 21 and as a part of the freedoms guaranteed by Part III of the Constitution'. The top court also ruled that like other fundamental rights, the right to privacy was not absolute and any encroachment will have to withstand the touchstone of permissible restrictions. A nine-judge Constitution bench headed by Chief Justice J S Khehar, which delivered as many as six concurring verdicts, overruled the contrary apex court verdicts delivered in 1950 and 1962 in the M P Sharma and the Kharak Singh cases holding that right to privacy was not part of the Constitution. The top court rejected the National Democratic Alliance government's vehement contention that there was no general or fundamental right to privacy under the Constitution. The lead judgment, penned by Justice D Y Chandrachud for himself, the CJI, Justices R K Agrawal and S A Nazeer, however, asked the government to examine and put in place a 'robust regime' for data protection in the modern era. 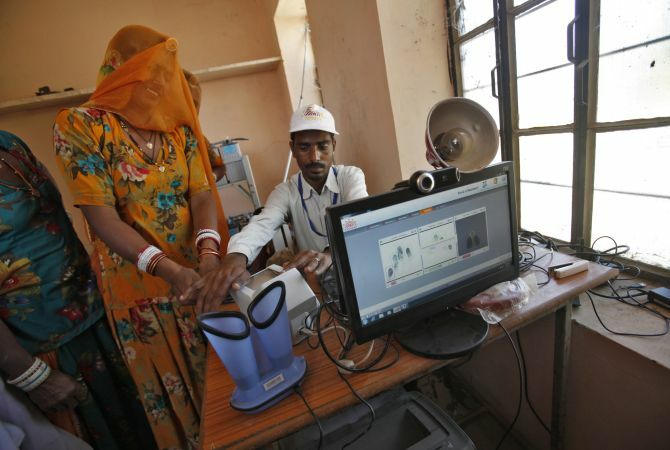 However, the top court gave a ray of hope to embattled government, whose Aadhaar scheme is under intense scrutiny over privacy infringements, said, "We commend to the Union government the need to examine and put into place a robust regime for data protection." "The creation of such a regime requires a careful and sensitive balance between individual interests and legitimate concerns of the state. The legitimate aims of the state would include for instance protecting national security, preventing and investigating crime, encouraging innovation and the spread of knowledge, and preventing the dissipation of social welfare benefits," it said. Besides the four judges including the CJI, Justices J Chelameswar, S A Bobde, Abhay Manohar Sapre, Rohinton Fali Nariman and Sanjay Kishan Kaul wrote separate, but concurring verdicts running into 547-pages. The judgment was welcomed by leading legal experts, including Law Minister Ravi Shankar Prasad, who is himself a lawyer. Noted jurist Soli Sorabjee said 'no fundamental right is absolute. It is always subject to reasonable restrictions'. While senior advocate Indira Jaising said 'privacy is fundamental. It certainly has an impact on the day-to-day life. This verdict prevents any kind of snooping', senior lawyer Kapil Sibal observed that like individual freedom, 'individual house, marriages, sexual orientation, right to space, right to move freely, right to eat what an individual likes, right to be left alone are protected both within the home and at public places to the extent necessary'. The CJI pronounced the summary of concurring verdicts in a packed courtroom at 10.35 am and said, 'the decision in M P Sharma (1950) which holds that the right to privacy is not protected by the Constitution stands over-ruled'. "The decision in Kharak Singh (1962) to the extent that it holds that the right to privacy is not protected by the Constitution stands over-ruled," he said. The bench put at rest the persistent query as to where Right to Privacy, if recognised as a fundamental right, would be placed under Part III (which refers to such rights) the Constitution. It said that right to privacy was protected as an intrinsic part of the right to life and personal liberty under Article 21 and rather, it can be traced to entire Part III as and as a part of all the fundamental rights. He then proceeded to declare that all verdicts, which recognised privacy as a key component of fundamental rights, delivered post the M P Sharma and the Kharak Singh laid down 'the correct position in law'. Justice Chandrachud, in his verdict, dealt extensively with findings arrived at in the M P Sharma judgement that had held that in the absence of a provision similar to the Fourth Amendment to the US Constitution, the right to privacy cannot be read into the provisions of Article 20(3) of the Constitution. 'The judgment does not specifically adjudicate on whether a right to privacy would arise from any of the other provisions of the rights guaranteed by Part III including Article 21 and Article 19. 'The observation that privacy is not a right guaranteed by the Indian Constitution is not reflective of the correct position. M P Sharma is overruled to the extent to which it indicates to the contrary,' the verdict said. Referring to the 1962 Kharak Singh judgment, the verdict said it was 'correctly held that the content of the expression ‘life’ under Article 21 means not merely the right to a person’s 'animal existence' and that the expression ‘personal liberty’ is a guarantee against invasion into the sanctity of a person’s home or an intrusion into personal security'. 'Kharak Singh to the extent that it holds that the right to privacy is not protected under the Indian Constitution is overruled,' it said. The bench then said that life and personal liberty are 'inalienable rights' and they are 'inseparable from a dignified human existence'. 'Privacy with its attendant values assures dignity to the individual and it is only when life can be enjoyed with dignity can liberty be of true substance. Privacy ensures the fulfilment of dignity and is a core value which the protection of life and liberty is intended to achieve,' the verdict said. The judgment said that "the dignity of the individual, equality between human beings and the quest for liberty are the foundational pillars of the Indian Constitution. Terming privacy as a 'constitutionally protected right', the bench said it emerged primarily from 'the guarantee of life and personal liberty in Article 21 of the Constitution'. 'Elements of privacy also arise in varying contexts from the other facets of freedom and dignity recognised and guaranteed by the fundamental rights contained in Part III'. Justice Chandrachud dispelled the notion that the judiciary was amending the Constitution, saying it was merely recognising the existence of the constitutional right and the exercise was neither in the nature of amending the Constitution, nor was the court embarking on a constitutional function of Parliament. 'Privacy is the constitutional core of human dignity. Privacy has both a normative and descriptive function. At a normative level privacy sub-serves those eternal values upon which the guarantees of life, liberty and freedom are founded. 'At a descriptive level, privacy postulates a bundle of entitlements and interests which lie at the foundation of ordered liberty,' the verdict said. The judgment said that privacy included at its core the preservation of personal intimacies, the sanctity of family life, marriage, procreation, the home and sexual orientation. 'Privacy also connotes a right to be left alone. Privacy safeguards individual autonomy and recognises the ability of the individual to control vital aspects of his or her life. "Personal choices governing a way of life are intrinsic to privacy. Privacy protects heterogenity and recognises the plurality and diversity of our culture. While the legitimate expectation of privacy may vary from the intimate zone to the private zone and from the private to the public arenas, it is important to underscore that privacy is not lost or surrendered merely because the individual is in a public place,' it said. The concern, raised during the arguments as to what would fall under privacy, it said that an exhaustive list or catalogue cannot be made. 'This court has not embarked upon an exhaustive enumeration or a catalogue of entitlements or interests comprised in the right to privacy. The Constitution must evolve with the felt necessities of time to meet the challenges thrown up in a democratic order governed by the rule of law,' it said. Justice Chandrachud said that the Constitution cannot be frozen on the perspectives present when it was adopted and it has to remain alive to changing times. On the issue of as to how privacy rights would be regulated as done in cases of other fundamental rights, the bench said, 'A law which encroaches upon privacy will have to withstand the touchstone of permissible restrictions on fundamental rights.